one of the larger pieces of wreckage found, a section of fuselage with a couple windows in it. link to flight path and altitude. Ok, so this plane has computer systems up the kazoo, and the computer flies the plane from beginning to end most of the time, the pilots just being there for backup. This flight crashed about a third of the way into a 2, perhaps 2.5 hour flight. Early reports of a Mayday call from the pilots - since “downgraded” to a “communication” or less [now being denied entirely] - happened about 40 minutes before the crash. This may or may not have happened at about the same time the airplane reached it’s cruising altitude of a surprisingly high 38,000 feet. The communication came within a few minutes of take off, in other words. Jets don’t take long to reach altitude. After that there was no further communication with the aircraft. At least that is my understanding at this point. 8 minutes before the crash the plane began a perfectly controlled descent from 38,000 feet to 6,800 feet. It never deviated from it’s course. And then it flew right into a mountain. And shattered into a billion pieces. 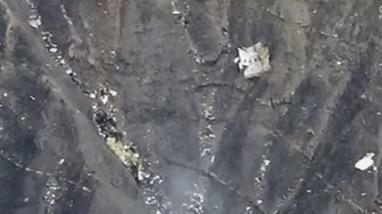 IF France finds the flight recorders, and IF they aren’t mangled beyond use, and IF they make the actual contents public record, then I won’t be at all surprised to find they didn’t record a word of cockpit conversation from within a minute after that distress call, nor a peep from the passenger cabin. I bet there won’t be any records of any AirPhone usage, or any outgoing messages from any of the cell phones on board. I think the plane was hacked. Brought down. A poison gas canister attached to the air system and triggered by the “seat belts” signal when the plane reached altitude. And exactly 30 minutes later, the engines were shut down. Either by programming or by remote control. And the computer flies the plane perfectly, like a glider in an 8 minute descent, right into an Alp. I think looking at the passenger list could be very informative. This looks like a hit. A major hit, at the level of nation-states or the largest criminal cartels. Or a worldwide group of fanatics. So, who was on this flight? Don’t expect an honest answer. There are no honest governments. Don’t expect a terrorist group to claim credit for this, IF they have the actual ability. Because if they do, then they’d be smarter to keep quiet and just take down planes at random, or when necessary. And don’t ever think that any government or “official” investigation is going to tell you if that happened. The airlines would be out of business overnight.